Schedule D Tools ™ will allow you to enter transactions through June 30th of the following year and generate reports for the current year and previous tax years. A Realized Gains Report can be printed for the first six months of the following year. CFS Schedule D Tools ™ contains software tools that keep track of a client's cost basis in stocks across multiple portfolios. The reports in Schedule D Tools ™ include a fileable Form 8949, as well as a Realized Gains and Losses report to produce the net amounts needed for your tax preparation software. Schedule D Tools ™ allows data entry throughout the year for high volume traders, generates reports to facilitate mid-year tax planning, and calculates and correctly reports complicated wash sales—even same-day and cross-portfolio wash sales. Schedule D Tools Data Entry is for use by tax preparers' clients to enter their own transactions. They can then give the data to the preparer for return and report preparation. The data entry program is for single-client data entry and does not prepare any reports. Easy Input Security Transaction Register. Stock/mutual fund symbol & name searchable database. Input screens for splits, sell by lot, adjust shares by lot. Mutual fund basis method choices include average cost basis or lot basis. Each client can have multiple portfolios. Historical prices may be entered manually in order to produce an Unrealized Gains Report as of a specified date (useful for tax planning, intangibles tax reporting, and estate tax valuation). Reports for 1999-current tax years, as well as a fiscal year. Prior-year closed positions can be archived. Reports saved and/or exported as PDF or Excel files. Columns in the Security Transactions Register can be rearranged for easier data entry. 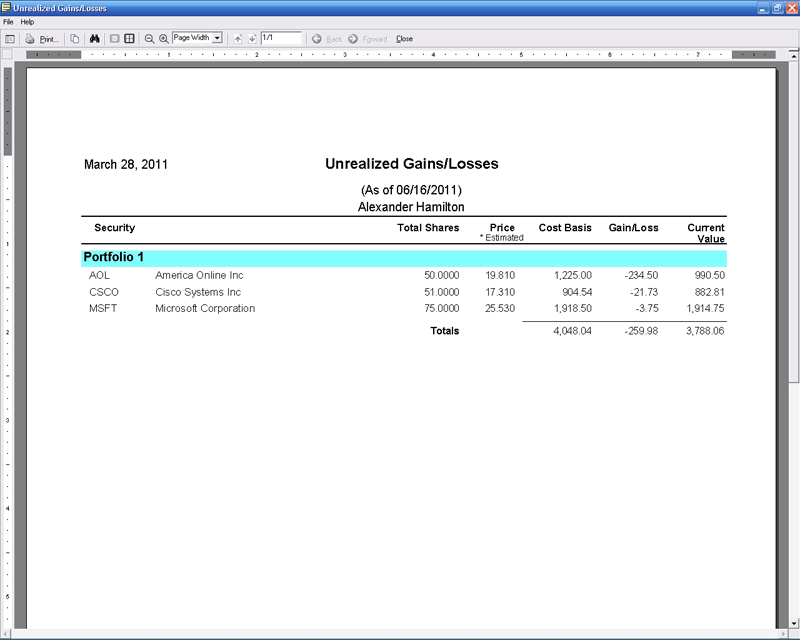 Client data can be imported from Excel files and comma delimited files. Client Data Entry version available—give it to your tax clients—they can enter their own transactions year round. Client info imports from CFS programs and other tax programs. Imports saved Mutual Fund Cost Basis files from TaxTools.